In this case we were able to interpret blood grouping cards, to allow us to determine further management for this pregnant lady. The first sample to interpret was the blood group of the pregnant lady which identified that she was group O RhD negative. When agglutination has occured (i.e. when anti-A reacts with an erythrocyte of group A) the aggluntinate stays at the top of the gel. If no agglutination occurs – the red cells will fall to the bottom of the gel. 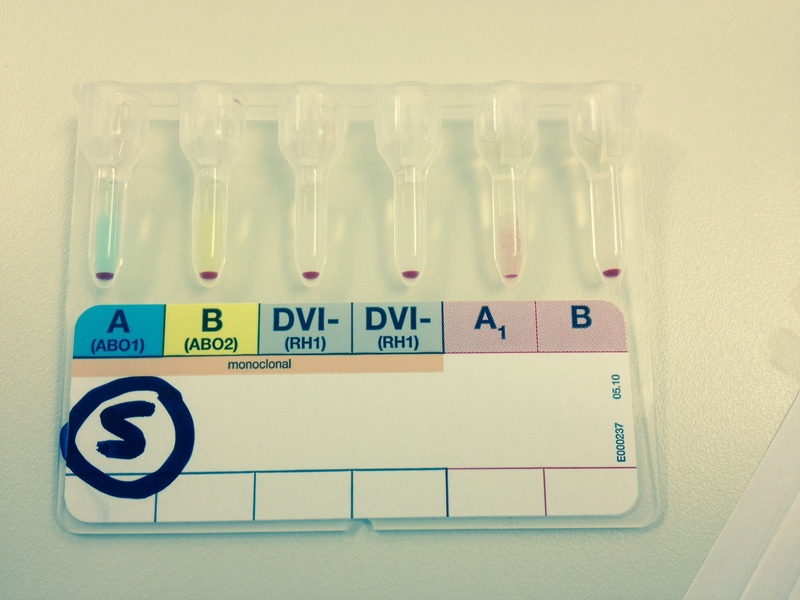 In this case – there is no evidence of agglutination with anti-A or B therefore the red cells do have these antigens present. There is also no agglutination with anti-D.
Agglutination is present in columns 5 and 6 which indicates that both anti-A and anti-B are present in the patients serum. Combining all these results together we can established that this patients blood group is O Rh negative. NICE guidelines state that all RhD negative women should be offered routine prophylaxis with anti-D during the 3rd trimester. >20 weeks – minimum dose 500iu – at this point test for FMH(fetomaternal haemorrhage) is required. If <4mls no further treatment required. If greater than 4mls, further dosage of anti-D should be given – calculated at 125iu IM per ml of fetal red cells detected. Either: single dose at 28 weeks. At this point a second group and screen sample should be taken for repeat antibody screen. This prophylaxis should be given, regardless of any previous anti-D treatment during pregnancy. Following delivery ABO and RhD typing should be taken from cord blood. If the baby is RhD positive, anti-D 500iu IM should be administered to mother, followed by testing for FMH. All D negative female of child bearing age should receive D negative and where possible K-negative blood. Where possible, D negative platelets, should be tranfused to D negative girls and women (if only D positive available, prophylaxis should be given). Finally, blood grouping was performed for the baby. This illustrated that the baby was also ORhD negative. And as suggested by some of the followers, we would not usually perform a reverse group on the baby, as at this stage ‘naturally occuring antibodies (i.e. anti-A and anti-B in this case) have not yet formed. lab error could also be a possibility. Thank you for your contribution on this case!